The Maintenance module gives you full visibility of your fleet status and lets you regain control over the maintenance jobs of your fleet. In order not to lose track while creating jobs and managing overdues, Cloud Maintenance simply divides these into two categories: Critical and non-critical. This division allows you to be aware, which of your jobs are class-relevant and of high priority at any time. Overdue jobs are highlighted to further ease process control management. Cloud Maintenance allows you to plan your maintenance work centrally, precisely and according to your requirements. 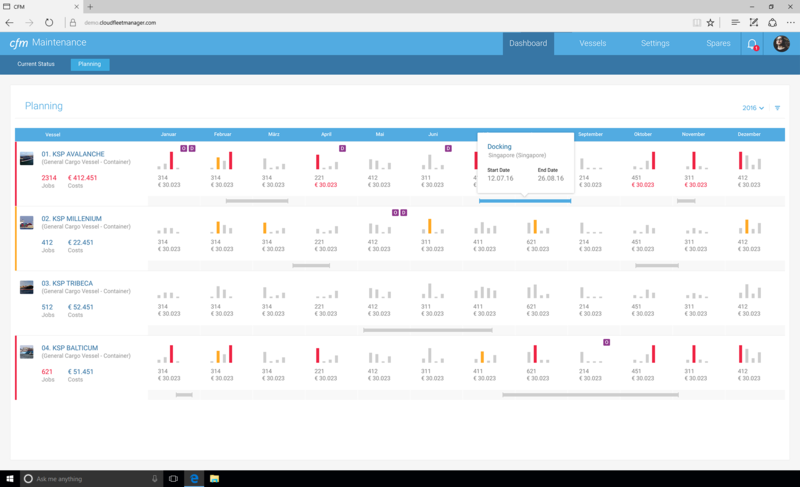 Through the clear and structured design of the solution you have the most relevant data displayed on the Dashboard, always, without having to switch between tabs. To avoid peaks, Cloud Maintenance offers the possibility of dynamic planning. This allows you to reschedule jobs at short notice and ensure that your jobs are distributed evenly, leading to maximum efficiency. 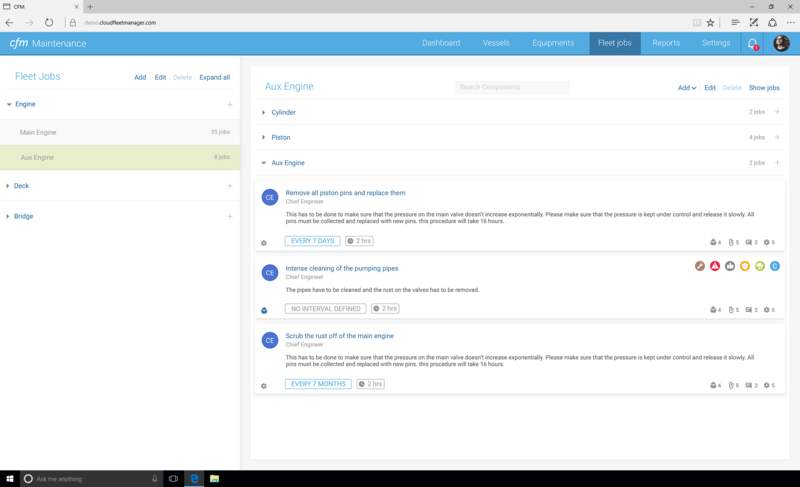 It has never been easier to plan and distribute your jobs. Cloud Maintenance enables you to enter all equipment and spares in the “Equipment Register” and precisely define jobs according to your requirements. Define jobs that must be carried out for specific equipment or simply create generic jobs which will be automatically assigned to your complete fleet. You can also create checklists for every job to make it even more convenient. In order to control the efficiency of your maintenance workflow and to optimize it sustainably, the cash flow planning option gives you the opportunity to make precise statements about the distribution of your jobs as well as the respective costs and the corresponding utilization of your employees. This allows you to optimize the efficiency of your maintenance tasks on the long run, to avoid peaks and to enhance the financial and temporal value. Complex and confusing solutions often do more harm than they add value. 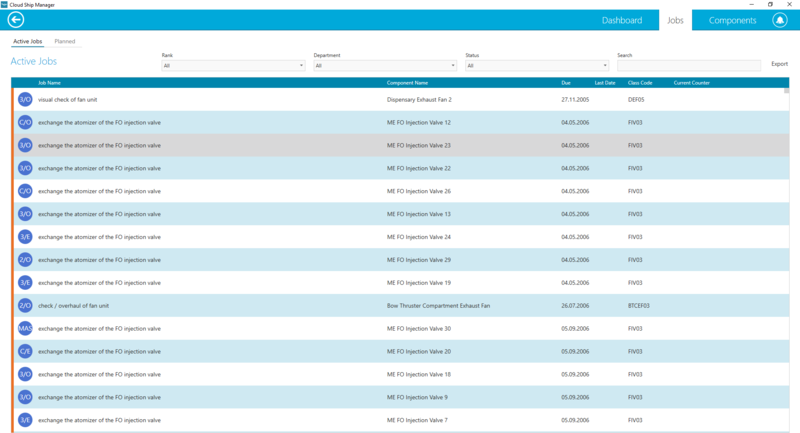 The clear, straight-forward and user-friendly design of Cloud Ship Manager lets your crew focus on the most important tasks and enables them to immediately work productively. The software is used intuitively and additional staff training is unnecessary. 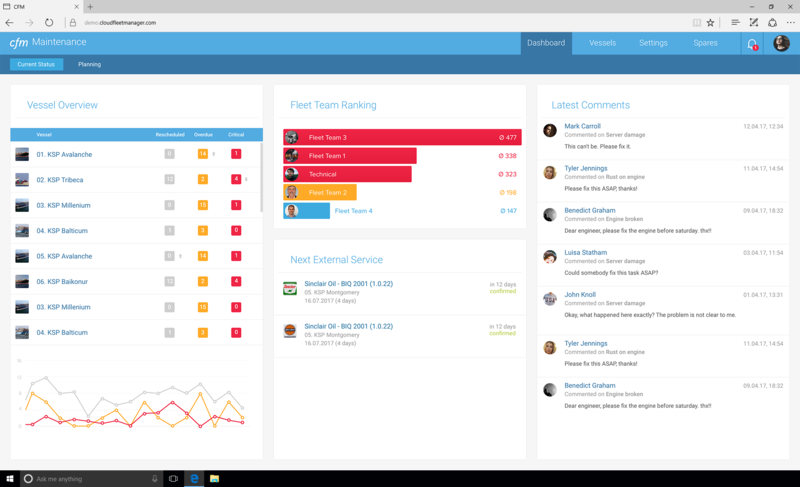 This way your crew can efficiently collaborate with your staff in the office and prevent data redundancy. Benefit from the deeply integrated environment provided by CFM. Define maintenance jobs and intervals according to your requirements. By categorizing your jobs, you are always on top of things. Analyze und sustainably increase your efficiency. Curious to learn more about Maintenance?